Picked up this nice unissued wool blanket today in Calgary. I don't know very much about them, but if I recall correctly the ones I've seen in the past only had one stripe on them. This one has a stripe at both ends. Also, there is no markings, tags, or anything indicating a manufacturer or year. I have always wanted one so I took a chance on it. Was I duped or did I get a good buy at $45? There was a price of $75 on it but the vendor threw that price out at me since I already bought a hundred bucks worth of other stuff. 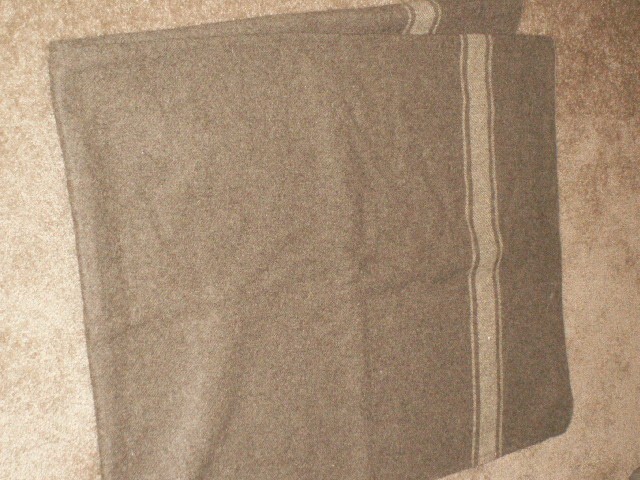 Re: WWII era Wool Blanket? Anybody have one in their collection that they can post here? I would like to see a comparison. I do have photos of my WW2 era blankets somewhere but not on my computer apparently. Regardless, it's easy to explain. They are grey with a black stripe about 7/8" wide (varies) running down the center length wise. They also have either one or two large C broad arrows silk screened, painted or stamped somewhere on the body. WW1 blankets were also grey but had blue and red stripes on either end in some configuration that I don't recall at the moment. Other than that I have seen red wool blankets with the black stripe which are post war. I have been told that there were also white blankets issued but have yet to see an example and so I'm a little skeptical that they exist. The blanket shown resembles a WW2 German blanket in a way but I don't believe it's Canadian. Good quality wool blankets are nice to have regardless. Post war 50's vintage blankets are identical to WW2 blankets save for the C broad arrow markings and they usually have a small tag sewn in the corner that states the blanket was mothproofed and the year. I've been told that most WW2 blankets were recycled and the wool used to make the blankets in the 50's which is why they are so hard to find today. I have some spare 50's era blankets. If you want one let me know. Crap! That figures. I checked some German blankets and they don't match either. This vendor is usually bang on with his items...he must be getting senile. But in the end, it's my own damn fault for not checking first. I will get back to you at the end of the month about the post war blanket. Pretty much blew my wad until payday. mk1rceme wrote: Anybody have one in their collection that they can post here? I would like to see a comparison. I posted a pic of my blanket on another forum a while ago,it was still on my computer. We all make less than ideal purchases from time to time. It's just a part of collecting.